Yep we are DOING IT. Cereal milk cupcakes. 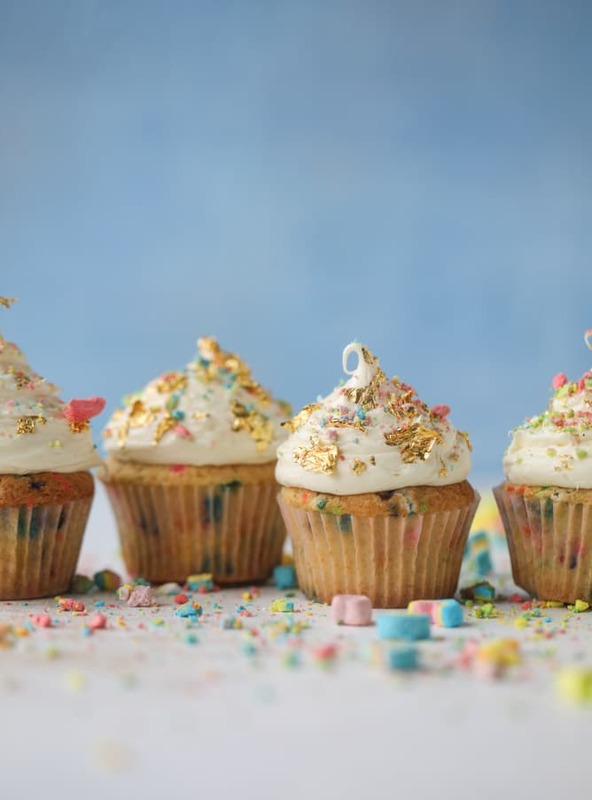 A little take on Lucky Charms cupcakes! Which is actually a take on confetti cupcakes that have cream cheese frosting and all sorts of cuteness on top. I wish it was appropriate to eat one every day! Ooooh I am so excited to tell you about these adorable cupcakes! Last year I made a Lucky Charms snack cake with cream cheese frosting that never saw the light of day. I was disappointed with the photos but also disappointed with the cake (it was way too dense) so I scrapped it at the last minute. For this homemade pub cheese spread. Which is, um… also amazing! Anyhoooo. I wanted to redeem the cereal milk cake. I knew it could be fabulous and also super cute for Saint Patrick’s Day weekend! First, this confetti cake recipe is the one from Seriously Delish – the one I used to make Max a little smash cake! I really love it. It’s SO deliciously vanilla-ish. I used the cereal milk in the cupcakes and a touch in the frosting too. Also, I’m having a huge moment with cream cheese frosting. Can’t help it! It’s so freaking good, so I used that here. With some serious Lucky Charms crumbs on top. Every year I like to share some sort of obnoxious recipe made with Lucky Charms. I’ve done this one bowl chocolate whiskey cake, this lucky charms shake and lucky charms chia pudding (p.s. use the extra cereal milk in this recipe for that!). Even though I don’t have much desire to eat a bowl of said cereal, the marshmallows are just too fun to pass up. Oh and I used more gold leaf on these cupcakes since I’m out of control. I can’t stop with the edible gold leaf! It’s adorable and fun and makes everything feel so fancy. You can pile on as much frosting as you want. I love the look of an adorable frosting-overloaded cupcake but in reality, this is not for me because it’s too much frosting! I just want a small layer – so if you do that, you’ll have lots of extra. Throw it in the fridge or freezer and then maybe sandwich it in between some chocolate chip cookies. 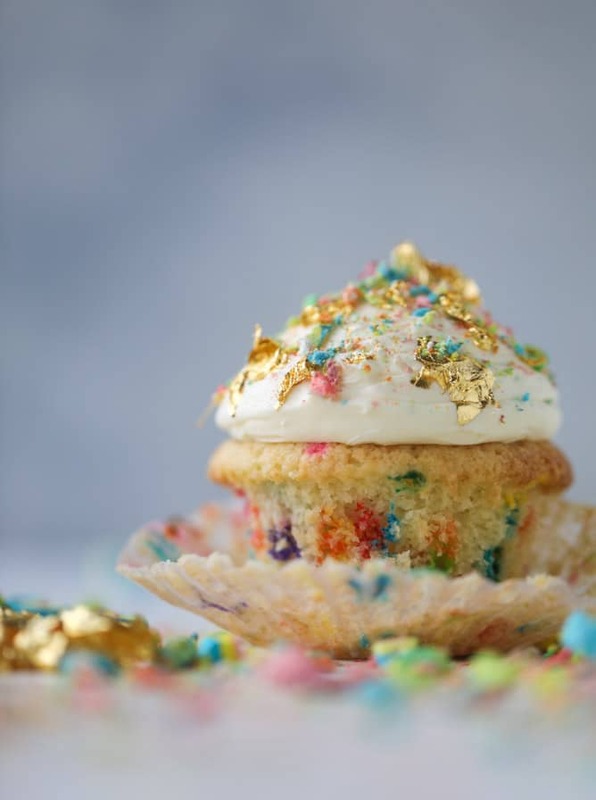 So now we can all have sparkly gold sprinkled mini cakes. All the exclamation points are very necessary. Place the cereal in a large bowl and cover with the milk. Place a bowl or plate over top of the cereal so it’s all pressed underneath into the milk. Let it sit and steep for 45 minutes. Strain the cereal out of the milk. Now you have cereal milk! Preheat the oven to 350 degrees F. Line a cupcake tin with liners. In a small bowl, whisk together the flour, baking powder and salt. Set it aside. Add the butter to the bowl of an electric mixer and beat it until creamy. Add the sugar and beat with the butter on high speed until fluffy, 2 to 3 minutes. Add in the egg and egg white, mixing well on medium speed until combined. Scrape down the sides of the bowl if needed. Add in the oil and vanilla extract, beating on medium speed for another minute. With the mixer on low speed, add in half of the dry ingredients. Pour in the cereal milk. Add in the other half of the dry ingredients and mix them on medium speed until the batter is combined. Use a large spatula to gently stir in the sprinkles. Divide the batter evenly between the cupcake liners, filling them 3/4 of the way full. Bake until the tops are set, about 20 to 22 minutes. Let cool completely before frosting. Once cool, frost with the cream cheese frosting. Add the crushed lucky charms marshmallow crumbs and the edible gold leaf. Beat the cream cheese and butter together until creamy. Beat in the sugar until combined. Beat in the vanilla extract. Frost the cooled cupcakes! So I know what I’m making next weekend. A biiiiig double batch of these babies! Yummy mouth watering recipe.I’m definitely going to try it at home. Please post more recipe like this. Thanks for this wonderful recipe. hi! the cupcakes are great from the fridge but i would wait to decorate until shortly before serving if possible. 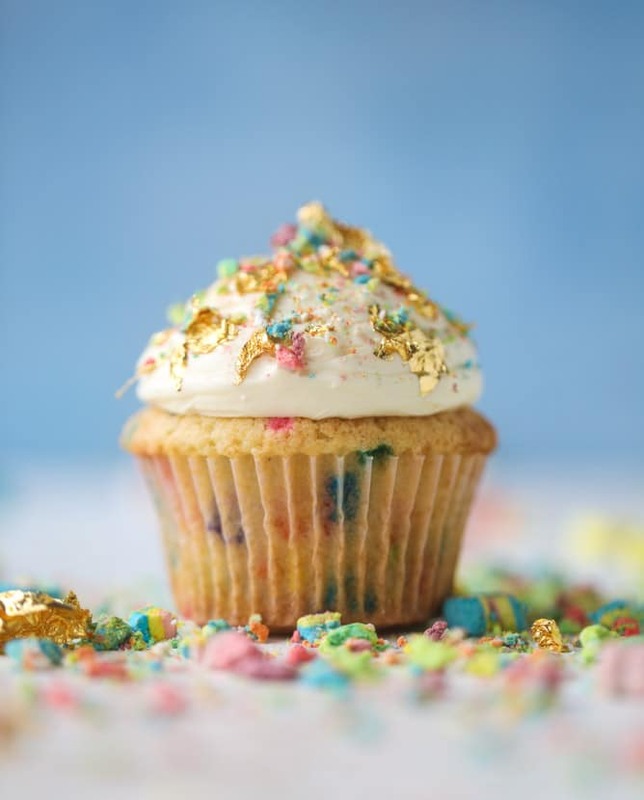 can you remove the cupcakes about 30 minutes before, add the marshmallows and gold leaf? I decided to frost them tomorrow morning and leave at room temp until serving. I will let you know how it goes. 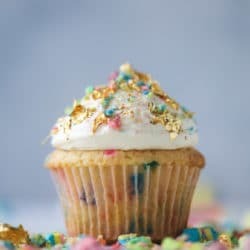 Sorry, I’m confused, the recipe says to make cereal milk using 3 cups milk and 2 cups lucky charms, but then the recipe for the cupcakes calls for only 1/2 cup cereal milk and the frosting, only another 1 tbsp. So why are we making so much cereal milk?